1. For the dough, add flour, egg, vegetable oil, salt and half of the milk into a large mixing bowl. Mix with a whisk and gradually stir in the remaining milk. 2. For the filling pumpkin wash and unpeeled cut into small pieces. Add to an ovenproof form, season with salt and pepper and sprinkle olive oil. Bake in the oven at 180 ° C (top / bottom heat) for 15 minutes. Remove and allow to cool. Feta is crushed with a fork, washed tomatoes, minced and cut, washed spinach and cut into small pieces, and lightly fry the pine nuts in a pan without grease. 3. Heat the pancake pan on medium level and add a little oil. Pour a small ladle into the center of the pan and spread the dough evenly with the crêpes distributor. Once the bottom has adopted color, turn the crêpe. 1-2 tbsp Feta, afterwards add some pumpkin, tomatoes, spinach and pine nuts evenly on the crêpe. Season with salt and pepper. If the second side is golden brown, fold the crêpe and serve. 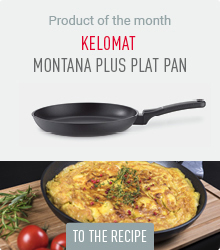 The CeraMic induction pancake pan from KELOMAT inspires all pancakes and crepes afficionados by its shape. With the one especially deep edge on the side the Palatschinkenwend in the air (east: “Schupfen”) for children’s play. As the name suggests, it can also be used on modern induction foci. Visually, it is externally coated with its orange-red Kelomat Color special coating and on the inside with the cream-colored ceramic non-stick seal – heat-resistant up to 400 ° – a piece of jewelery in every kitchen. Even functionally, it leaves nothing to be desired: The pan warms up quickly and quickly starts (heat can then be quickly reduced again). The ceramic coating prevents the dough from being applied and allows easy turning. The flattened edge on one side makes it easy to turn with a soft ladder or in the air, even for untrained people. 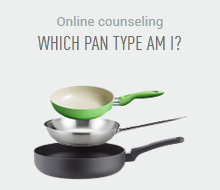 The crepes pan is only one of a total of six colored pans of the KELOMAT CeraMic induction line.